The International Travel Writers & Photographers Alliance is a professional network of travel writers and photographers who hail from around the globe. Our mission is to bring like-minded professionals together, provide our members educational opportunities to enhance their travel writing and photography skills, and also help them sharpen their marketing expertise… so they're not only producing better articles and photos, but selling more, too. We invite both seasoned and relatively new travel writers and photographers to apply. Though ITWPA members are just as likely to be full-time writers and photographers as they are part-time, we ask that members nevertheless publish at least two travel articles or sell two photographs a year to maintain their member status. Of course, it's our mission to help you do that, and we'll provide you all the tools you need to make it happen! 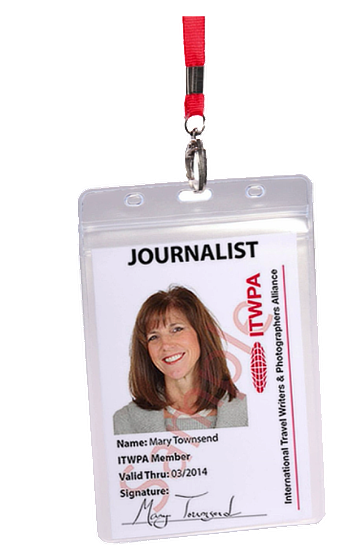 ITWPA membership starts with the exclusive ID badge… lending you confidence and credibility to gain travel writing perks and open doors around the world. 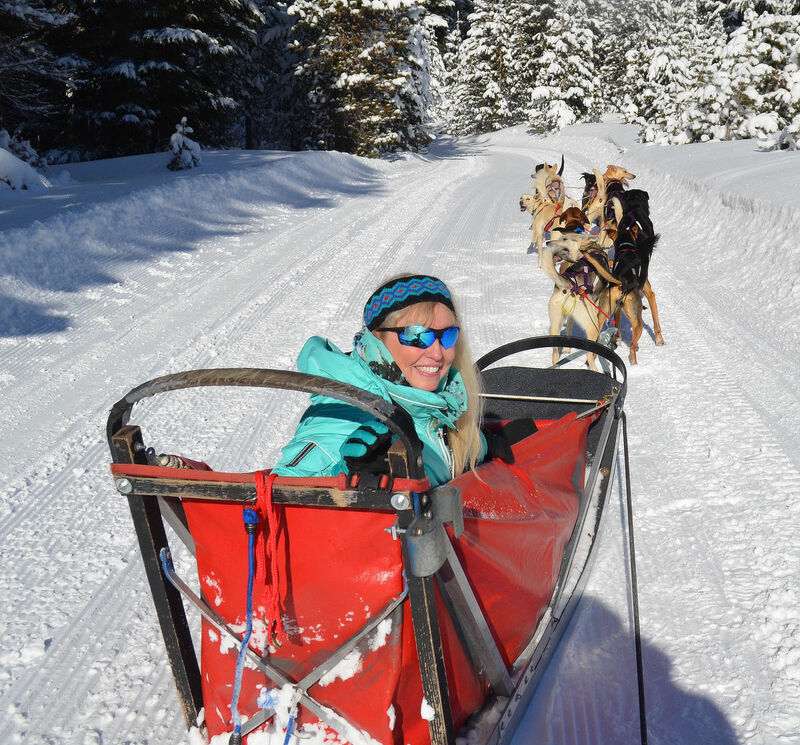 Badge-carrying members have the ability to contact the right people… the people who give you complimentary meals, accommodations, spa treatments, and more so you can enjoy the exciting life of a travel writer while writing stories and taking photos for publication. This membership ID badge can be essential in helping you land that first published clip…or first photo sale. 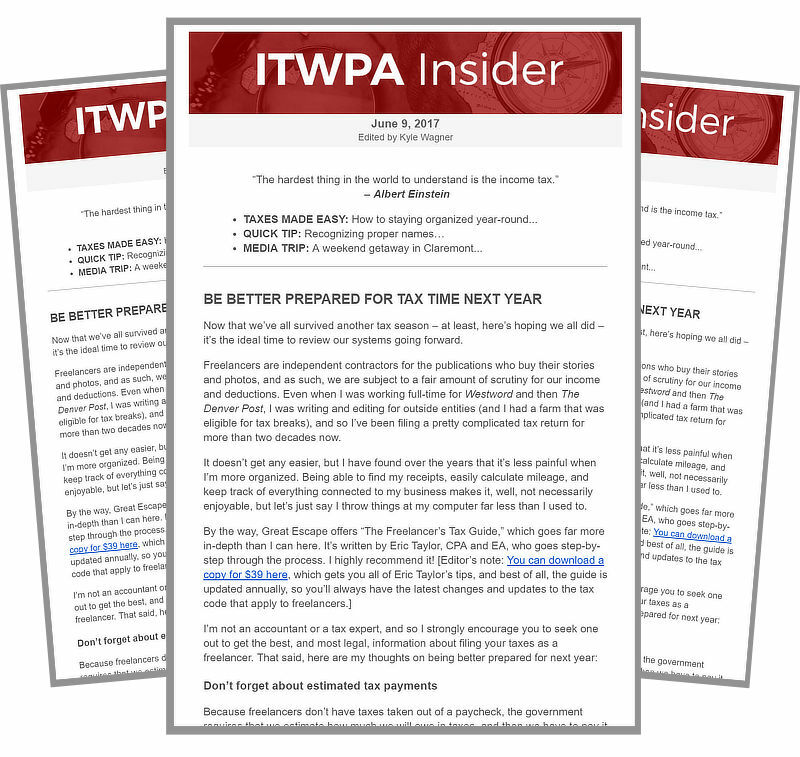 As an ITWPA member, twice a month you'll receive the ITWPA Insider. For members only, it includes press trip listings (invitations for complimentary travel, like rafting in the Pacific Northwest, on-the-house or a stay at a beachside spa)… profiles of publications where you could get your work published… and practical articles about how to write better, travel smarter, and earn more. Edited by Kyle Wagner, former Travel Editor at the Denver Post, the ITWPA Insider delivers industry insights and how-to advice -- all designed to boost your chances of travel-writing success have you enjoying amazing perks in no time. And because photography goes hand-in-hand with travel writing, the ITWPA also gives each of its members an individual photo website – and a masterful one at that. You don't have to design it or maintain it or even pay for it. Simply drop in the photos you want to display, and in less than 10 minutes, you've created a simple, professional portfolio of images to send off to an editor. With this special online gallery, you simply give an editor the link to your shots, and she can choose the ones that make your piece come most alive for her readers. We’ll make it super easy for you to get your first articles published. 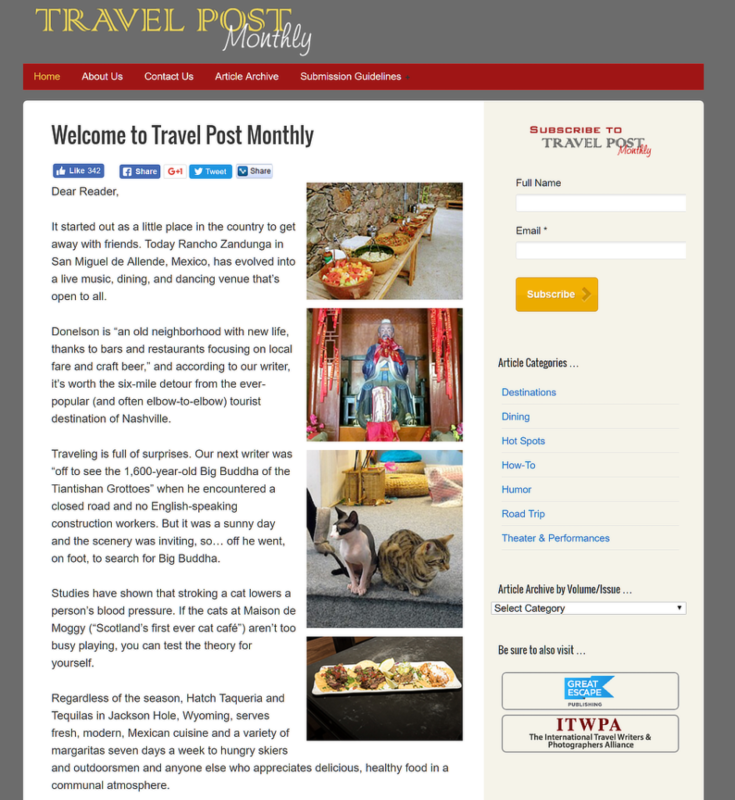 As an ITWPA member, you're invited to contribute articles to the organization's online travel magazine, called Travel Post Monthly. In it, you'll find top-quality travel articles and photographs produced by members – sound travel advice to save you time, money, and trouble when you travel. This is a great publishing opportunity for you – an ideal way to land a by-line. Plus at the bottom of each published article or photo appears contact information for you, the contributor. That's great news, because the ITWPA sends its Travel Post Monthly to an ever-growing list of travel editors – editors who are looking for content to fill their own print and online publications. Over the course of a year with my ITWPA card, I visited 45 U.S. cities, Tahiti, Bora Bora, Mo’orea, Japan, the Bahamas, Hawaii, and 12 Mexican cities. I attended fairs and festivals, lounged on gorgeous beaches, tried indigenous food, consumed copious amounts of ice cream, “endured” spa treatments, went skydiving, hang gliding and swimming with sharks, bargained with shopkeepers, and even had a geisha makeover. 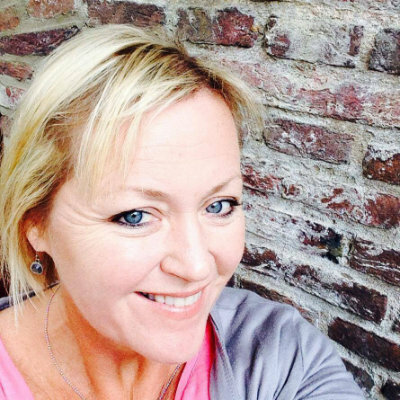 Without my ITWPA training, I would not have known how to get press trips, and without press trips, I would not be able to be living the travel writer’s life. 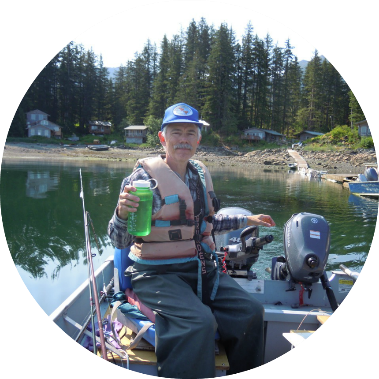 Kurt Jacobson is a former chef traveling the world in search of great food, interesting people, fine wine, nature, fishing and skiing. New Zealand, Japan and Europe are his favorite international destinations. He has visited all 50 US states and constantly explores hidden gems. When not writing on his blog, or Trip101.com he posts to Facebook, and Twitter often. Last year was one of the most incredible years I’ve experienced as a travel writer. I took so many trips one friend suggested I find a suitcase that could be thrown into the laundry with my clothes inside, eliminating the need for packing and unpacking! ITWPA members get a $200 discount on any Great Escape Publishing event, including the Ultimate Money-Making Photo Workshop, the Ultimate Travel Writer’s Workshop, and all of our expeditions abroad, too. And, as a member, you get a special, downloadable voucher for $100 off any International Living event, too. ITWPA members also gain special Member Discounts on travel supplies, recommended books, and other practical resources for traveling writers, like reduced-rate magazine subscriptions, great deals on luggage, discounts on writer's supplies, and more. Plus members also receive great discounts on apartment rentals and resort stays all over the world – from Montana to Panama, Paris to Oregon. This is a savings worth hundreds – even thousands – of dollars. And these discounts are yours, simply for being a member of the ITWPA. As I mentioned above, ITWPA Membership is open to both seasoned writers as well as beginners. This is a powerful membership for those looking to land their first byline, so we’ve added three bonus reports to help you reach your goals even faster. … here’s your chance to turn your dream into reality… faster than you ever imagined possible.